At w+r we work closely with kitchen designers to maximize the potential of polished concrete within the kitchen environment. Polished concrete is an alternative to other everyday countertop materials for the design conscious and offers the advantage of being able to produce a seamless, joint free working surface. Each concrete countertop is hand trowelled producing a surface patina of true uniqueness, depth and warmth. Our cast in-situ countertops can be integrated into any kitchen design to a high specification and finish and can incorporate any sink, hob or other kitchen appliance model. 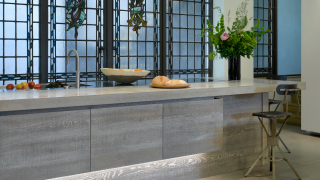 We have an ongoing collaborative relationship with , offering and supplying our cast in-situ concrete countertops as part of their worktop range. The bespoke hand crafted nature of our countertops and surfaces marries perfectly with the beautifully designed, bespoke and handmade kitchens and furniture that Roundhouse excel in. Roundhouse extol the virtues of British design and their philosophy of combining contemporary aesthetic with timeless elegance and craftsmanship is one that we share. Examples of our concrete countertops can be seen at Roundhouse showrooms in Wigmore Street, London and Montpellier Arcade, Cheltenham. Please contact us if you have a project you would like to discuss or to find out more about collaborative possibilities.